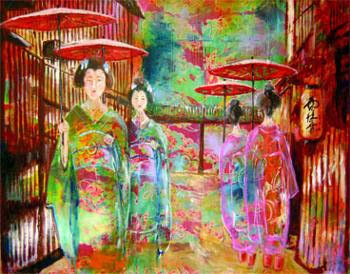 Artist Keigo Morita is displaying his exhibit Women at the Kyoto Grand Hotel and Gardens in Little Tokyo. The display began on August 8th, and will run until Saturday August 15th. You can view it at the Rasen Gallery inside the Kyoto Grand. The Kyoto Grand is located at 120 S. Los Angeles Street, Suite 270, Los Angeles CA.
" Keigo Morita created a special new way of painting no one had done before. He made canvases from "Japanese Kimono" and painted on them. But when he had the idea, he had two problems. One is, if oil paint can stick to this canvas or not. The other was, even if paint sticks to this canvas, the Kimono itself is art, and too bright to set off his painting to advantage. But he solved these problems by treating the canvas with some special basic paint, and using colors that make the most of the brightness of the Kimono. These paintings are his first works. Now he is still groping for the different, better way of painting that matches the Kimono canvas."